WESTLAKE VILLAGE, CA, November 19, 2013 — Guitar Center Professional (GC Pro), the outside sales division of Guitar Center that focuses on the needs of professional users, recently sold two Focusrite Red 1 500 Series Mic Pre’s to Germano Studios, one of the world’s premier recording facilities. These are among the first Red 1 units to be purchased since they recently began shipping. The acquisition of what is considered by many discriminating ears to be among the finest microphone preamplifiers ever designed will help support Germano Studios as a leader in bridging cutting-edge technology and classic analog sound. The sale to studio owner Troy Germano took place in October and was handled by New York-based GC Pro Account Manager Tony Donelson. The original Focusrite Red Range gained legendary status immediately following their release in 1992. 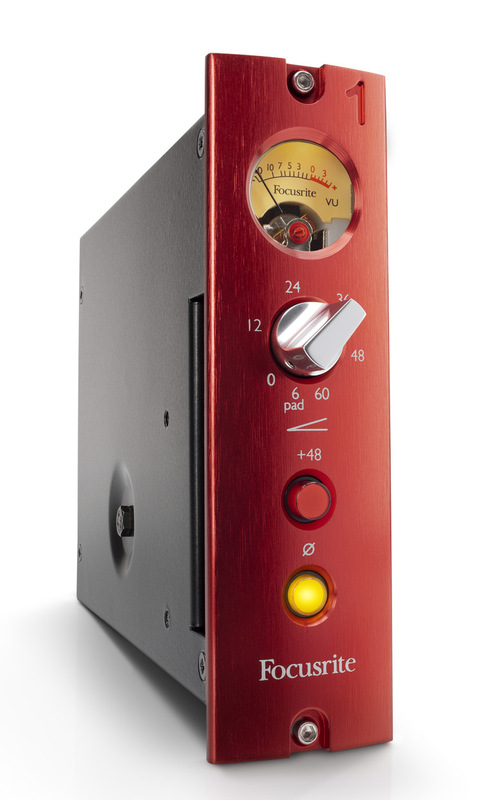 The Red mic preamps rapidly became highly sought-after in the world’s top studios, with their unique signature sound and ability to perform faultlessly on a wide range of instruments and with almost any microphone. Made in England like its forebears, the new Red 1 500 Series module carries on the legacy of the Red range. "The Focusrite Red 1 500 Series mic pre's are a perfect addition to our Studio 1,” states Troy Germano, who is also a three-time recipient of the prestigious TEC Award, in the category of studio design. “These new, stellar-sounding 500 series modules give the engineers another great option when recording." Photo Caption: Focusrite’s Red 1 500 Series Mic Pre. Guitar Center is the leading United States retailer of guitars, amplifiers, percussion, keyboards and pro-audio and recording equipment. Our retail store subsidiary operates 255 Guitar Center stores across the United States. In addition, our Music & Arts division operates 101 retail stores specializing in band and orchestra instruments for sale and rental, serving teachers, band directors, college professors and students. We also are the largest direct response retailer of musical instruments and related products in the United States through our wholly owned subsidiary; Musician’s Friend, Inc., and its catalogs and owned or operated websites. More information on Guitar Center can be found by visiting the Company’s website at www.guitarcenter.com.